Merry Christmas! Now the day after Christmas, I have to say it's been one of the best ever. 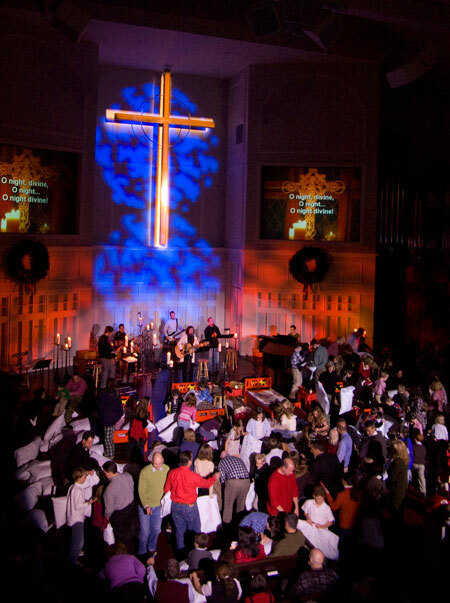 Rather than bore you with all the personal details of our Christmas (which you can read about here if you're interested...), I thought I'd give you an glimpse into what Christmas services were like here at Upper Room/Christ Presbyterian Church. First of all, there were a lot of them. Thankfully, I was only responsible for 2. Upper Room put together the 2 PM "Family Friendly" service and the Midnight gathering. In between were CPC's 4, 6, 8 and 10:00 services. Since we share the same room and equipment, yet have vastly different worship styles, we decided to split up gear. 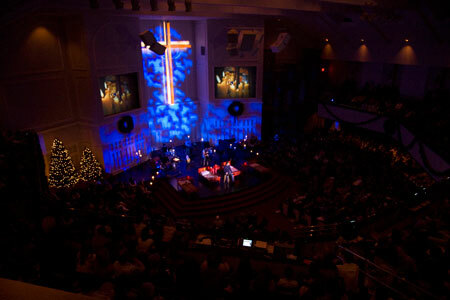 CPC's lighting needs were pretty basic, so they used our conventional, installed light rig. 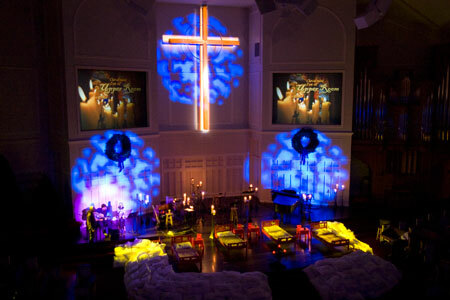 For our 2 services, we brought in six MAC 700s and brought out our Expression 3 console. As you can see from the pictures, it looked pretty nice. It's truly amazing what you can accomplish with a limited number of moving fixtures. How do you make a very traditional space look contemporary? Black it out and add some cool lights! My lighting guy, John, and I arrived Sunday to set up and program the cues. In about 4 hours we had both programs done, and were heading home. This made Monday a breeze. I had already built the Media Shout scripts on Friday, so we were in really good shape. For audio, we had our normal 5 piece band and 2 vocals, which was set up very quickly. Sound check went well, if not a bit slower than normal, but we were ready to open doors at 1:50. Thankfully, it was not a production heavy service. Mostly hymns, a really fun kids drama (utilizing the 4 beds on stage), and a message. We also put together a click-track video that ran over the live band performance of While You Were Sleeping by Casting Crowns. I had a bit of a challenge in putting together the click, so I'll be writing a quick post with some suggestions on that in a day or so. Hundreds of parents and kids stormed the stage to get their pillow. Few (if any) were hurt… Seriously, it was really cool. Our biggest challenges came right after and right before our services. We had to completely strike the stage after the 2, while CPC was setting up. Then a few hours later, as soon as the doors opened after the 10 finished, we rushed in and re-set. 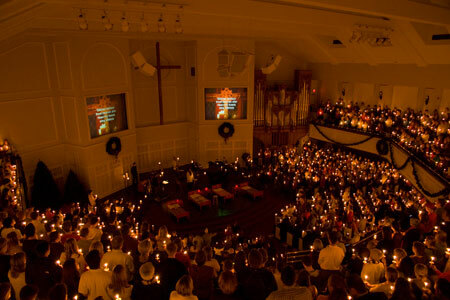 Because of the Upper Room worship style, we hang heavy black curtains around the entire lower level, black out the windows, and put of a ton of candles. All of this had to be set, removed and re-set. I personally thank God for the dozens of volunteers who made this happen quickly and smoothly. The midnight service was almost identical to the 2 PM, with minor changes. I came in early to fix my click track, and we tweaked the lights just slightly. The atmosphere was really introspective and worshipful throughout the entire evening by design, though it was amazing how many people showed up at Midnight! The funniest moment of the evening (for the crew anyway) was during the candle lighting. At the end, the band was working their way toward Silent Night and the lighters started firing up candles. Because of the location of the tech booth, we couldn't tell how it was going. The plan was to do a 30 second light fade to black as the candles lit up. The trick was to not fire the cue too early and leave everyone in the dark, or too late and make it look silly. We took our best guess, and it worked out great. The lights faded down almost imperceptibly and the room grew bright with candle light. I mean it was bright! There is not a lick of electrically driven light in the room at this point. Just about 1500 candle-power. So there we were, relishing in the moment of a perfectly timed light cue when the Creative Director (who sits in the house, nearby stage left) comes on the com and says, "OK, you can take the lights now…" John and I looked at each other and I replied, "Uh, what lights, they're all out." "That's crazy!" he said, "Amazing, OK never mind." 1500 candles will really light up an all white room. After that all we had to do was shoo everyone out so we could pack up and go home. It was a herculean effort, but in under 25 minutes we had the lights and sound struck and we were ready to go. All in all, it was a great day, very worshipful and low stress. I'm thinking this is how Christmas should be!